More than ever, it feels like most TV and movie comedy is made by a very specific and contained number of people. 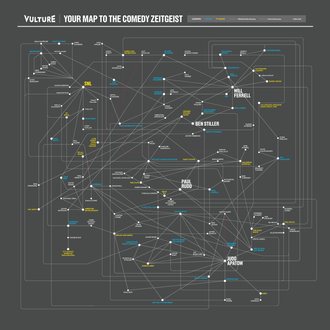 Over the past decade, the major cliques — tied to the anchors of Judd Apatow, Will Ferrell, Ben Stiller, and SNL — have intermingled (with Paul Rudd as the most common overlapping constant), making it so the entire comic Zeitgeist is determined by one giant mass of interlocking and ever-shifting personalities, which Vulture has painstakingly mapped out here. Before you explore, some methodology: This is not a complete list of projects, as we have left off movies that simply retrace already connected relationships (Your Highness); we did not count a handful of guest appearances on a TV show unless they felt essential to the series; we did not include some very funny people (Louis C.K., Patton Oswalt, Sarah Silverman, the cast of Community) whose roles have not widely overlapped with those mapped out here, and who — aside from occasional cameos — work mostly on their own removed projects. So click below to expand our comedy cosmos and marvel at how, unlike our own solar system, this one has boundaries. And let us hope that it is stable, lest it collapse into itself and become an infinitely dense mass of shrieking white men.